The ScanMaster IE is equipped with the latest development of CCD cameras viewing from front and rear. With two cameras per 100mm of product, multi-CCD cameras and 360° viewing capability, the user will be able to remove the smallest defects to give very high quality final product. Incorporated in the machine is a patented circuit which may be applied to divide accept or reject by the size of the given spot. Colour intensity may also be controlled hence the dividing line between accept and reject can be determined by the operator. 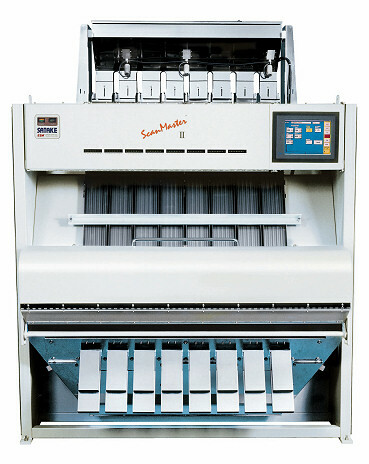 The ScanMaster IE is ideally suited to all types of peanuts, almonds, coffee, beans and plastics. Typical Foreign Material contaminants removed include discoloured, damaged and mouldy product. The ScanMaster IE may be connected to factory PLC units, or directly to a personal computer through the use of an optional line driver card.